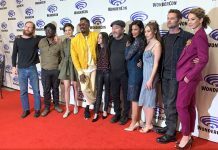 HNS attended the Fear The Walking Dead press room at Wondercon where we spoke with Lennie James, Alycia Debnam-Carey, Garret Dillahunt, Scott M. Gimple, Greg Nicotero, Jenna Elfman, Maggie Grace, Danay Garcia, Colman Domingo, Andrew Chambliss, and Ian B. Goldberg. Season 4 Premieres Sunday, April 15 at 10:00 p.m. ET/PT. Catch all-new episodes of Fear the Walking Dead Sunday nights on AMC!